I am surprised my daughter didn’t think about what I assumed was obvious. “Oh, I’ve thought about it every day this week,” I interjected as her Dad chuckled from the living room, his feet propped up, lying back in a recliner. Her last things are what I think about as often as I eat lunch. A few weeks ago, while on a walk, a friend shared a story about her marble jar. She told me that each marble represents the number of weeks she has left with her last child at home before he leaves for college. I realized that if I had a jar for my daughter, mine would hold approximately 37 marbles, a sobering thought as she prepares for college. Our marble jars are becoming clear glass as time empties. What does it mean to live wisely and well? Do we know how to do this without regret? Perhaps the way to live well requires dying first. Die to the mistakes you made in the past, the ones you can’t do anything about. Die to your idealistic view of the future, that best version of yourself instead of God’s unique calling you weren’t expecting. Die to your need for tidy outcomes and then die again when the fear of not knowing causes heaving in your chest. As we die to our assumptions, presumptions, and expectations, we harness the unfiltered light of our imperfection, beholding truth and beauty. Embracing last things cultivates destiny. Your goodbye makes hello possible. Today is my last marble in the jar for Living the Story, my column here at BibleDude.net. I’ve thought about it over the last few weeks as often as I eat lunch. My time writing stories here started as divine providence, an unexpected gift on my birthday. A year later, I look back with surprise for what God knows is obvious. Just like parenting my daughter, the journey was never about numbers, weeks, or marbles, but building relationship. I’m thankful for Kelli, Kris, Ashley, and Christie, for the way we’ve done life together as a team on a sacred haunt for redemptive beauty; casting our words out for the masses and pulling in the riches of heart transformation. The way to find fulfillment is following in His footsteps. Empty the marble jar, allow Him to fill it. Die first and then live well. Thank you for extending your love and encouragement through the comments as I’ve written here for the past year of Mondays. May your Advent season be full of expectant waiting for His vibrant marbles to fill your empty jar. I wondered this past week as we celebrated our second Thanksgiving without my mom (really the third since that one was celebrated in the hospice house, and she was not really “with” us), if this could be the last with my dad. Or with any of us. Because we never know what the next moment will bring. I wonder if instead of “losing our marbles,” we should consider placing a marble in a jar to mark each day–time filled to overflowing. What a joy to journey with you, Shelly! Much love. Yes to this! 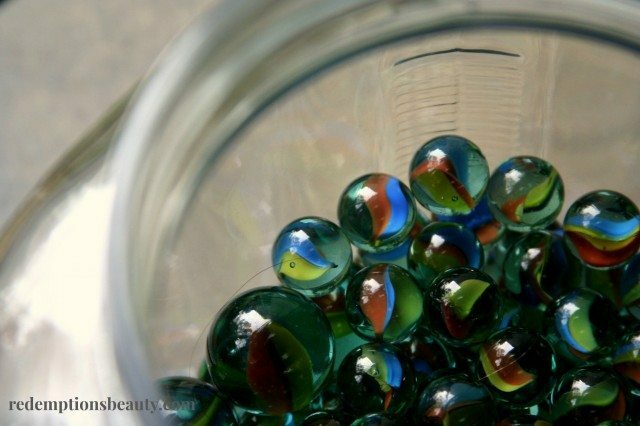 Marbles to mark the time we had…watching gratitude grow with each glassy sphere. Thanksgiving will now always be the anniversary recounting the week after I nearly lost my daughter to the grill of an 18-wheeler. I’m thankful for each and every marble I have in the jar. Thanks for sharing Sandy, you bless me. This is beautiful and precious for so many reasons, Shelly. Why am I surprised that even in your “goodbye” you would be passing on gifts, passing on wisdom? Yesterday, our priest reminded us of Paul’s words: I die every day. They’ve been rattling around in my mind ever since. And now this. I love it when God gives us sacred echoes so we’ll hear the message he is speaking to us. So thankful for you Christie. I pray our paths will continue to be tandem as we do life. It’s been quite a ride. And I am better for having tagged along. I love you, Shelly Miller. You are a great companion to have on the journey Kelli. It’s not the end, just a different view right? Maybe it’s the timing…because His timing is always perfect…that I’d be so drawn to your words lately. I think about a marble jar; I could fill one with marbles to count down the days until my husband is home again. I’ve chosen instead to make a tree. The tree will start with no leaves and as each day goes by I will place a leave on it and write a blessing found in that day. By the time my husband returns the tree will be full. And maybe for me this reflects how I’m not losing something but each day I’m given a new gift. Because every day with Him is a gift. Did that make sense? Many blessings to you sweet friend. Someone else I know is doing that tree of thanks. Love the idea Beth. And I’m glad that you are drawn by the Holy Spirit, that the words are timely for you in this season. God is good to do that. I’m thankful. As I sit here in the hospital with Dad, can’t help but think about how he (and I) would face the days ahead, if someone came in and plopped a jar of marbles down on the table next to the IV pole. What if we knew how long he can live with this disease? Would I be more brave or less as the jar emptied? Something to think about in the midst of this storm… haven’t really seen Luke in a month…missed his last game…bittersweet and teary today. He’s my baby you know…love you Shelly, thanks for everything…really..
I’m so sorry you are going through this with your Dad . . . for both of you. And I know you are equally grieved about missing Luke’s last days as a senior. We’re both teary today . . .and God is collecting them, with us always. Love you Dea. Shelly, you put words together in such astounding ways. So often, as I read your posts, my spirit shouts from within, “Wow! Beauty AND inspiration! Now THAT’S worth remembering and embracing.” Today, this paragraph caused that reaction: “As we die to our assumptions, presumptions, and expectations, we harness the unfiltered light of our imperfection, beholding truth and beauty. Embracing last things cultivates destiny. Your goodbye makes hello possible.” As an empty nester, I can attest to your observation. I am saying “hello” to new experiences with a beauty of their own, and praising God that each chapter of life brings its own set of blessings! I appreciate your kind remarks Nancy, thank you. I think every time I die to life and the way I see it, and allow God-room to create, I marvel over the beauty that unfolds by letting go. I often see how his plans were so much better than my well meaning assumptions. So beautiful, Shelly. I have been blessed by your sharing here and look forward to seeing what God does with this step. Much love to you. Me too Laura. Looking forward to next steps and what they hold for me. 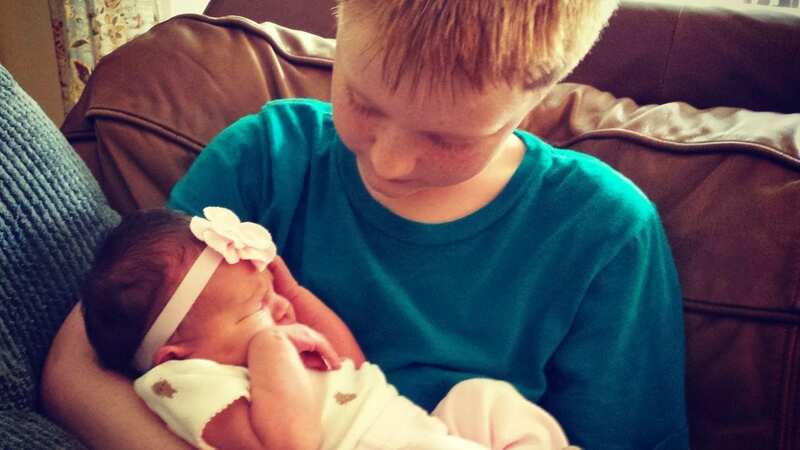 Shelly, this touches me for so many reasons — of course as a mama, watching little people grow long and limby before my eyes and also because I’ve known this to be the case over and over again: that continual dying is the only way to truly live. Thank you for your friendship, for inviting me to journey with you here, for the continual gift of your words. I look forward to seeing what God has for you next. Much love to you. So glad to have you on the journey Ashley, sorry it ended so abruptly. I don’t think its the last of our partnership though. Thank you for constant encouragement Joy, what a gift you are. May the love you share so generously with others be returned to you one hundred fold. Lovely, bittersweet, poignant – like so much of life. I’ll miss this weekly column, but I do now that transitions eventually bring something new and wonderful to replace what has been lost. May you blessed in this one. Thanks for being here Diana. I’m hopeful about what lies ahead, even though I see it dimly. I’m trusting for clarity and perspective as I walk this part of my faith journey. I have made me some little and big silly mistakes the last couple of weeks and the Enemy has been using them to haunt me. I just have to remember that Jesus’ blood paid for it all……..and go on when the sun comes up on a new day. Your writing always speaks to me. We have a choice (thank God) don’t we? We can stay behind and wallow in the death of our choices or move forward and welcome new life that hope brings with it. I think I struggle with forgiving myself for “what I’ve done and what I’ve left undone” the most in my life and He has already forgotten about it when I asked him to forgive me. Lets move on shall we, and leave it at the Cross now. Love you Jody, thanks for the way you encourage, you are a gift. How I love conversation that means something, as your beautiful words always do. Dying to my mistakes will be tumbling through my mind for a few days as I work the neccessity of it over and scrape up the willingness to do it. Thank you.